We just got a bunch of pictures of some nice fresh walls in hamburg with lots of new posters, stickers and tiles. Thanks again to TXMX for uploading the great stuff! Aw° sent us some pictures from krakow showing mostly stencils and stickers. Nice to see some vinyl and 3.5" discs again. Hey, here is a quick list about whats going on this summer in Berlin. There is a nice Streetart-Event taking place in Berlin this Summer. We recieved lots of pics from Prague with some styrofoam stuff. At the moment theres a nice exhibition of the artist Point open from 6.5.-5.6.2008 at "Point Shop" Trafo galerie - kurta konrada 1, praha 9. If you are in Berlin these days make sure to visit the vernissage and reopening of the Urban-Art.info-Gallery by our dear friend Juergen Grosse (+ secretary) in Berlin-Mitte!! Auch dieses Jahr organisiert das "Kolah-Studio" in Teheran im Iran eine grosse Sticker-Streetart-Aktion! Aussgestellt und verklebt werden eure Sticker & Plakate, welche ihr bis zur Deadline am 20.July verschicken koennt! Hey. 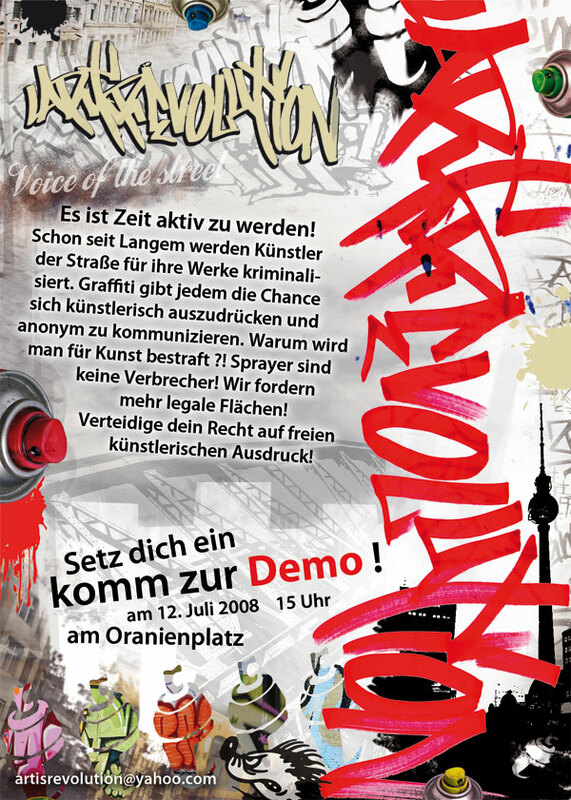 There will be a Graffiti-Demonstration in Berlin at the 12th of July! ..starting 3pm / Oranienplatz! Check the Flyer for more Infos (german)! Protestzeichen der Anti-Atom-Bewegung im Wendland. Unterwegs mit El Bocho auf den Strassen Berlins.